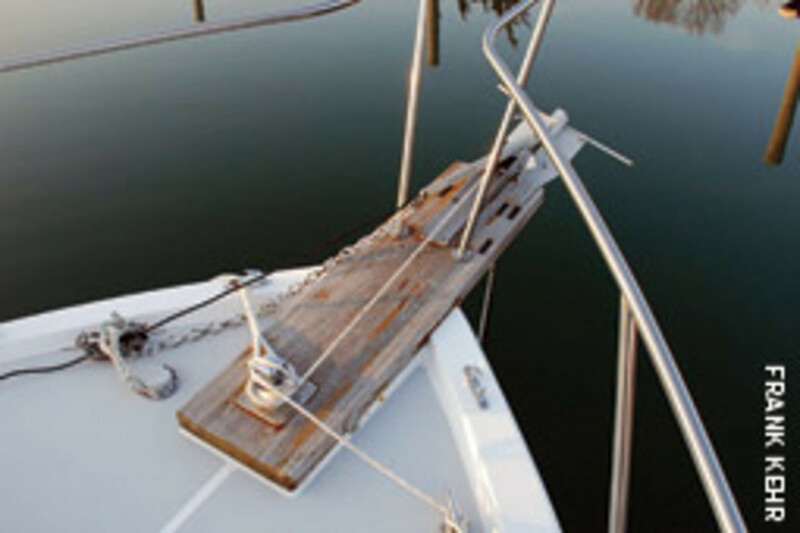 Boatyards are often full of projects that went uncompleted because, somewhere along the way, someone either figured it wasn’t really what they wanted or didn’t plan effectively and came up short either financially or skillwise. 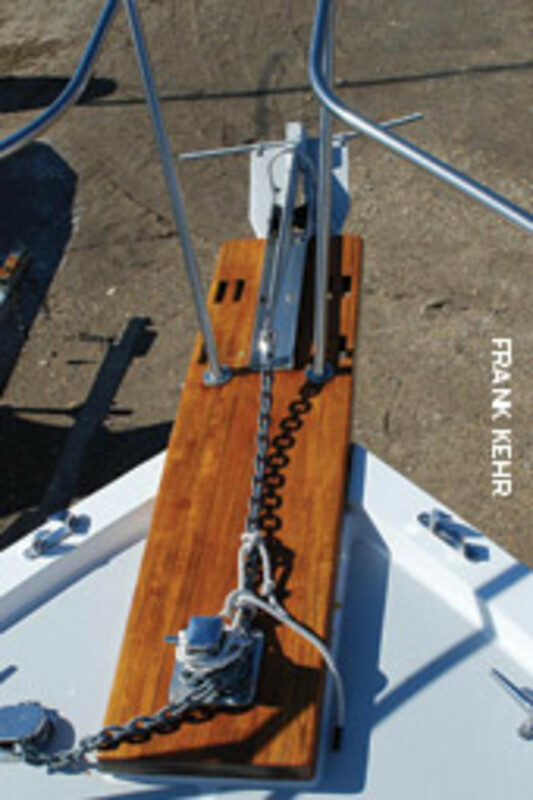 All of my projects start by confirming that the accessory, modification or, as with the Cape Dory case study here, the boat is what I (or the purchaser) wants. For example, relatively minor projects like installing electronics require familiarity with the helm area and electrical system. There’s an installation sequence provided by the manufacturer, but beyond that it’s up to you. 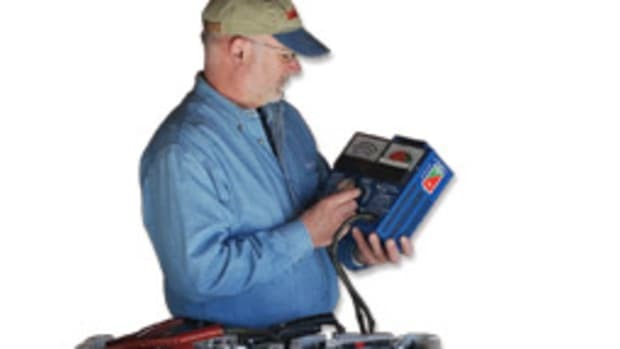 I read through the instructions, making notes of tools, fasteners and wiring connectors required, and I make certain that everything is at hand prior to starting the work. Naturally, the bigger the project, the more involved and detailed the work list would be. Be honest with yourself as far as skills are concerned, and source out anything you don’t have tools for or that is beyond your ability. If you’re purchasing a project boat, the requirements get a bit more involved but can be easily broken down into manageable parts. 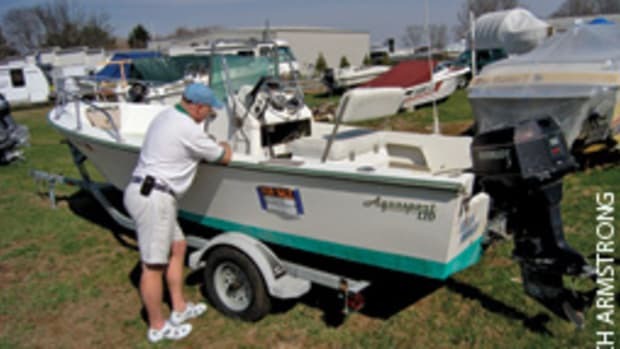 The entire boat needs to be inspected so you can determine what you will need to put into the project — and if it will be worth it for you in the end. Willie Keillor, owner of this month’s project boat, a 1988 Cape Dory 33 Flybridge, says he believed this particular boat was worth his time and money because of its quality construction and hardware, and due to the pedigree of this sailboat builder. Inspection requires basic hand tools: a quality flashlight or two, pad and pencil, mirror, digital camera, and a few clean shop towels. Note-taking can be tedious and impractical at times, so I often carry a small digital voice recorder and dictate anything I believe is important, including equipment manufacturers, models and serial numbers. That’s also where I rely on the digital camera. For example, I photograph such general areas as the cluster of hoses, fittings, valves and pumps that comprise the black water system. That photo can be used to evaluate the overall system, to review what needs to be replaced or repaired, and as a guideline for purchasing replacement parts. Not much different than photographing the helm layout to help visualize an electronics installation. I can often get the camera into places I can’t get my head into, which lets me “see” behind bulkheads, under engines, etc. I’ve found some unbelievable issues even with new boats using this technique. Once I’ve gathered my information, I list it in categories and prioritize it. In addition to listing anything that appears abnormal or requires attention, I consider what effect any tasks would have on vessel safety and operation, which gives me a starting point for creating my prioritized work list. I also consider the skills required to accomplish tasks, be it changing diesel injectors, replacing worn hoses, or replacing aging hatch gaskets. I need to know what I will be able to handle and what outside sources I may require for hands-on work or consultation and guidance. All of this information will figure into the final work plan. My inspection begins with the most difficult to access and critical areas, usually the machinery space, then moves to easier areas. I systematically go over the entire boat, trying to avoid surprise expenses and wasted time when the project is in full swing. The following case study will give you an idea of how it all comes together. Keillor was looking to move up from his 1989 Boston Whaler Temptation 25 to something that would provide more comfortable accommodations, while adding a bit of self-sufficiency for extended weekend cruising or overnighting on the hook. Diesel power would be a plus, though not required. 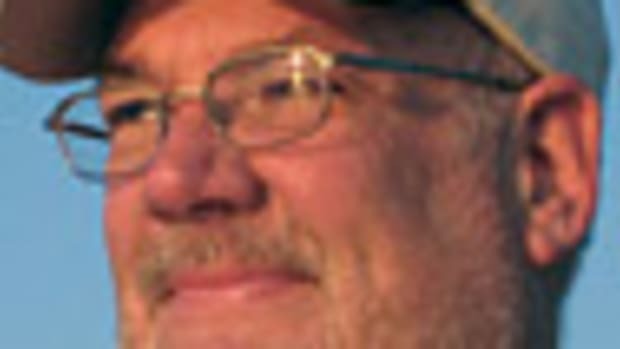 He had a budget in mind and would consider paying a bit more for a very special boat, but he was really looking for a project in which to invest his own labor, turning another boater’s problem into his reward. Keillor, 28, isn’t new to projects — we’ve done several together — but this would be a huge step up in time and money. I got a call the day after Christmas 2007. “My dad and I are looking at another project, can you take a ride with us?” asked Keillor, first assistant engineer aboard a roll on/roll off car carrier, who calls Wading River, N.Y., home. After looking at numerous boats in the 28- to 38-foot range, Keillor kept returning to a 1988 Cape Dory 33 Flybridge that was stored at our marina in Southold, N.Y. Attracted by its classic lines and the fact that it had almost every amenity he was looking for, the “project process” had begun. 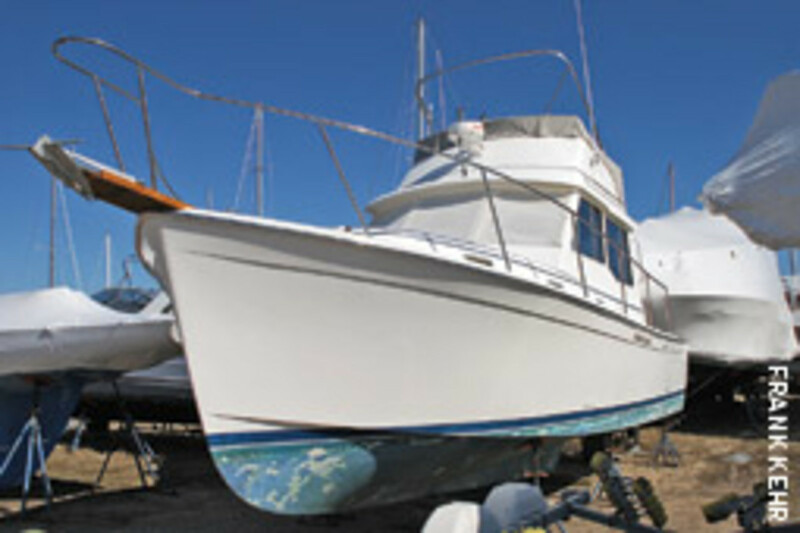 The boat had been for sale more than five years by the original owner, who had simply tired of boating. It was priced high when originally listed, but during those five years its condition had deteriorated steadily because of a lack of use and maintenance. Unfortunately, the recently lowered price still seemed a bit high. Keillor had already determined he wanted the boat, but he wanted to find out just how much of a project it would be and what, if anything, he could use to negotiate the price. A systematic inspection of every inch of the Cape Dory was required, owing to its long storage time and lack of owner presence. I was tasked with looking for signs of proper maintenance and storage practices, appropriate wear and tear based on the boat’s 350 engine hours and 20-year life span, and determining any inherent deficiencies. Keillor had already gone over the boat’s exterior and made up a list of questions and concerns we would need to address. Having been through other projects together, I knew his list would be accurate and comprehensive. Keillor says he talked to other Cape Dory owners about gelcoat cracking with the boat and discovered it was common and not considered a real issue. “It’s caused by the builder using too much gelcoat in spots, which eventually cracked,” he says. Keillor had researched the boat’s systems, so we were aware of the inherent issues and could focus immediately on those areas. I quickly saw some of the reasons why the boat didn’t sell. I listed and photographed every issue I could find, and there were plenty. 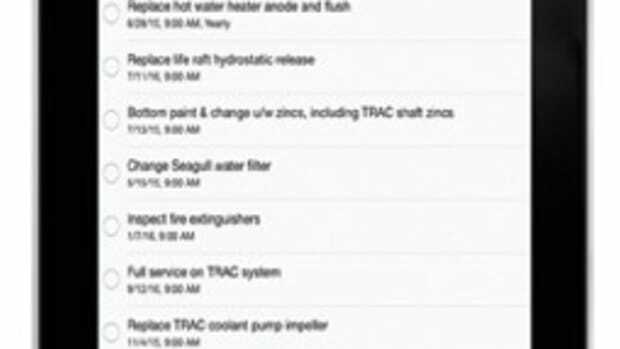 The machinery space inspection also revealed such typical issues as dry-rotted hoses and belts, worn pump impellers, leaky seawater pumps and frozen seacocks, but there also were more serious concerns. 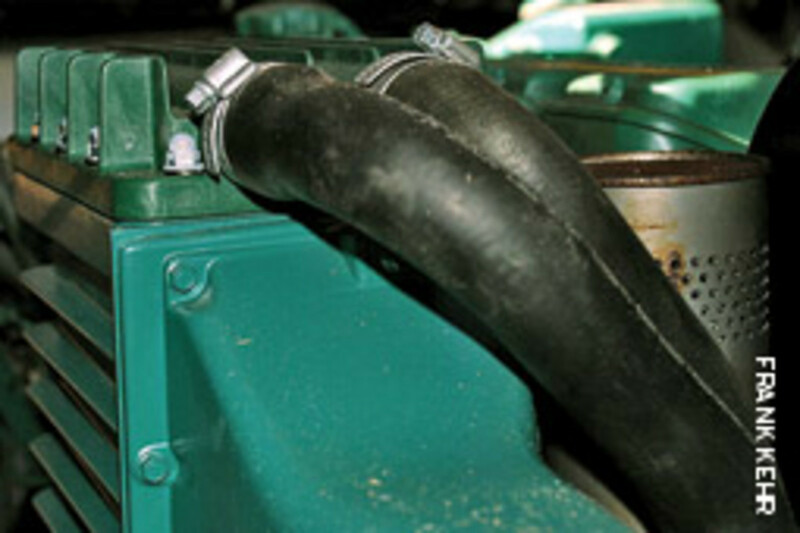 Both of the twin Volvo turbo diesels had holes in their aftercoolers as a result of seawater corrosion. 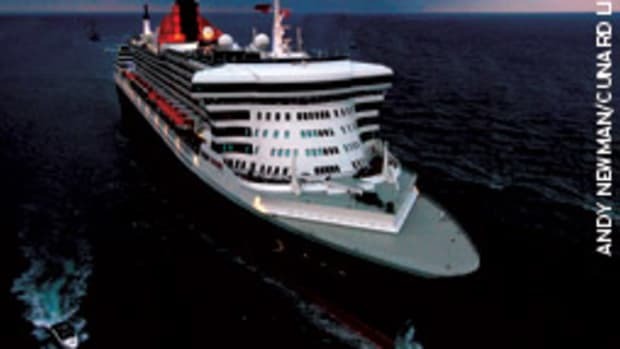 The raw-water side of the engine cooling system had been leaking and spraying seawater on the engines, transmissions and adjoining machinery. 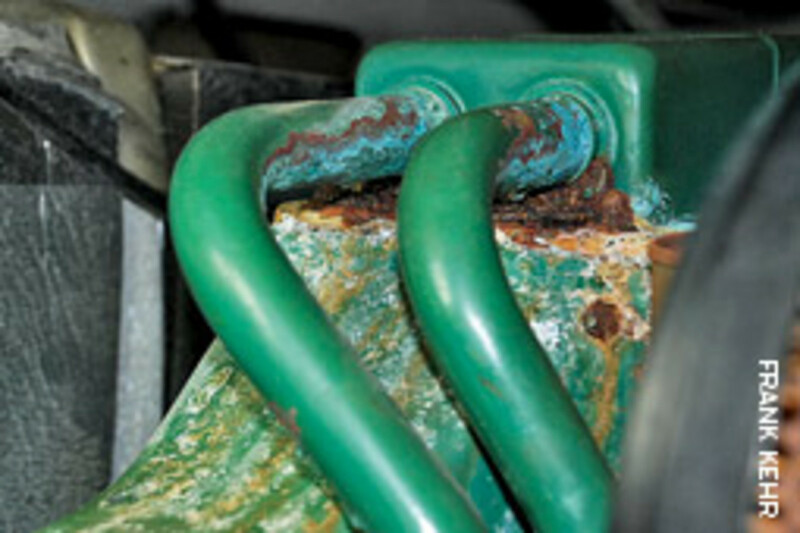 One engine starter had been replaced without taking care of the surrounding corrosion on the engine, indicating that someone had the “quick fix” mentality. The other starter would require replacement as well. Most of the engine hardware and fittings would require attention because of corrosion. It appeared that only minimum routine maintenance and service had been done. The heat exchangers, engine oil coolers and transmission oil coolers were original and appeared untouched. The stuffing boxes had been leaking badly, adding to the corrosion in the area. The engines were visibly out of alignment with the shaft logs, and, with the heavily corroded engine mounts, realignment would be difficult. I also knew that the cutless bearings would be worn because of the misalignment. There comes a point when you must re-evaluate the project you’re about to undertake, and I privately felt this was that point. I wasn’t sure just how much of a commitment Keillor was prepared to make in terms of time and expense, but I knew he would want to use the boat a few months down the line. If he was to undertake this project, it needed to be very organized. To determine if we should continue looking into the project, we discussed the most costly issues found. The list went on and on — as did the inspection, at Keillor’s direction. Fortunately, the rest of the inspection revealed only typical wear and tear, such as outdated sanitation hoses, corroded electrical terminals, etc. The boat’s structure appeared sound and very well-built. There were interior cosmetic issues — for example, the saloon headliner was detached, and there were a few loose screws here and there. The Cape Dory’s exterior also needed some work. The boat has minimal exterior brightwork, but it was in poor shape. The flybridge had been left uncovered, so the cushions and dry-rotted canvas would need replacing. And the built-up bottom paint would require stripping. The machinery space issues notwithstanding — along with the 5-year-old-diesel fuel in the tanks — the boat turned out to be in good condition. I spent several hours filling in my list, then combining it with Keillor’s. Then we went over each point together. We shuffled items up and down the priority list while trying to put a dollar value on the project. We combined the safety and reliability columns, as they should work hand in hand. 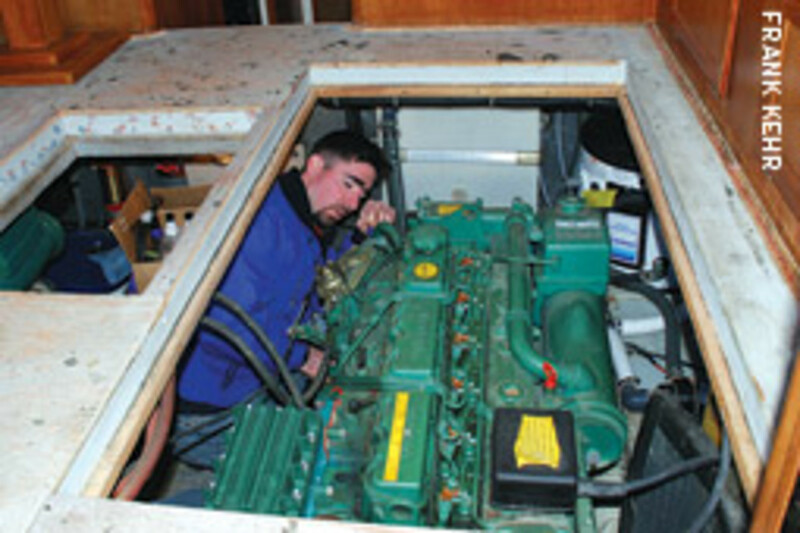 General maintenance was split into “have to do” and “would like to do.” We had to go through all of this before committing to the time and expense of a sea trial during winter, as the boat would require commissioning and rewinterizing after the test drive. We reviewed the list and included such items as adding a dedicated house battery bank for the inverter and replacing the rotted hot water heater. Cosmetic issues were placed at the bottom of the list, as the goal was to get the boat under way and log some hours during the first season. Once we had a practical order for individual tasks, we discussed the skills necessary for each. We determined that most of what needed to be done required no sophisticated, specialty equipment beyond basic hand tools — and a desire to learn as we go, and Keillor is a very capable learner. We also determined that the work required to make the Cape Dory into an operable boat could be done by spring, so we set a date for the sea trial. The sea trial revealed additional issues with the engines and transmissions. We now had to contend with leaky injectors, a malfunctioning engine synchronizer, and a transmission that wouldn’t shift after it warmed up. On the positive side, Keillor loved the boat’s ride and the way she handled, which provided renewed enthusiasm for the long haul ahead. Back at the dock, we took engine and transmission oil samples and sent them off to the lab for testing. That proved to be the straw that almost broke the camel’s back; the analysis reports weren’t encouraging. There were potentially costly expenses ahead, and Keillor initially decided against the purchase. Weeks passed, and there were discussions between all parties until a purchase price was agreed upon. “After looking at everything wrong with the boat, I knew that we had gone through it with a fine-toothed comb, and I could deal with the issues for the right price,” he says. Keillor bought the Cape Dory in March and began work immediately. Following the guidelines we established, he worked with the goal of splashing the boat in the spring. The Cape Dory was launched in March 2008 and has logged more than 95 hours since, almost 25 percent of what had been logged in the previous 20 years. I recently spoke with Keillor about the project. He said that the first ride after launch made everything he went through worthwhile, and that there was only one surprise after running the boat all season. The hydraulic steering pump seals went bad, requiring a new helm pump. Keillor began addressing some of the cosmetic issues last summer and will continue this summer. The interior headliner has been removed and awaits the installation of 3/8-by-4-inch finger joint wainscot. The saloon sole will get a teak-and-holly covering or carpet. An anchor windlass sounds destined to be on this year’s project list. The machinery space will get cosmetically reconditioned, and the fiberglass is due for a thorough compounding and waxing. The original flybridge canvas is being replicated by an upholstery shop, along with cushions. On the long-term list are air conditioning and a generator. The bottom paint will be stripped next winter, and a barrier coat and new antifouling will be applied next spring. I can vouch for the time and effort he has put into the Cape Dory. It certainly appears to have been worth the investment.